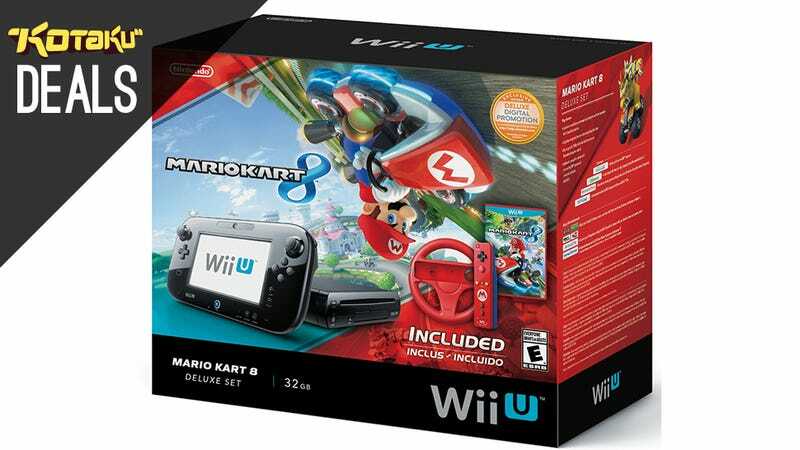 Nintendo has also announced a Wii U Deluxe Bundle that includes Mario Kart 8, a red Mario Wiimote, and Red Racing Wheel for $330. That bundle also nets you the free game. Amazon is running quite the sale on Kindle Books today, the highlight of which for many will be several Vonnegut classics while we'll link to directly. Of course, we recommend browsing the whole selection. The Mohu Curve is basically the Mohu Leaf that we know and love, but with a stand so you can set it next to your bronze statues and candelabras, instead of hanging it from your wall. Sony's NEX-6 is a fantastic camera that Gizmodo recommended at $850, calling it the "sweet spot" in the market space, and went on to say it was "hard to imagine a better design." Available today for $525, its lowest price ever, it's an absolute steal. This flash drive will work with your computer, but a hidden MicroUSB plug will work with your Android device as well. Free Velocity Ultra for Plus Members. preorder Mario Kart 8, and Register it by July 31 to get Your Choice of New Super Mario Bros U, The Legend of Zelda: Wind Waker HD, Pikmin 3, or Wii Party U Digital Download.